How Effective Is Your Online Reputation Management? Do you find that your business is struggling to generate new customers? When faced with such a daunting realization, it’s tough to even think twice about your online reputation. 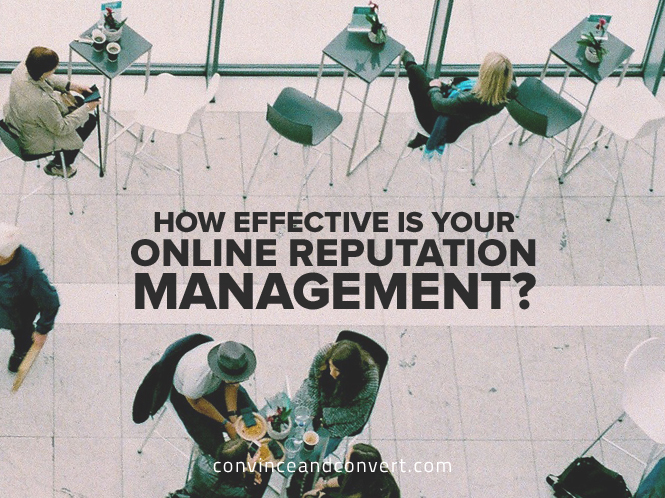 However, if online reputation management is not consistently on your to-do list, then your business is likely to run into problems. How often do you allow someone else’s opinion to influence your decision making? Probably a lot, huh? Now imagine all the friends and relatives that have ever recommended a business to you, and multiply that by millions. That’s the reach that the internet has created in terms of influencing decisions. 81 percent of shoppers conduct online research before buying, and part of that research will involve analyzing the online reputation of relevant organizations. Surprisingly, consumers are just as likely to take the advice of strangers on the internet as they are from their own friends and family. 92 percent of consumers trust peer reviews over advertising, so you better believe that negative reviews can cause them to sway from your direction towards one of your competitors instead. You may call me crazy, but I’ll say it: Online reputation management is more important than digital marketing. You can perform all the SEO, social media, and paid search campaigns you want, but it only makes your negative reputation that much more visible. When such a high percentage of consumers research before they buy online, you can’t assume that potential customers aren’t going to look at your reviews. A lot of companies chuck millions of dollars at digital marketing without even looking twice at their online reputation. If your business is plagued by nasty comments and reviews online, then you might as well be throwing all that money away. Without an effective strategy to guide you through reaching out to your happiest customers and ensuring that they are the most vocal, you could be turning away hundreds of potential customers every day. Businesses are blinded by the internet becoming the ultimate marketing tool. It’s baffling to think that many people consider it to be a complete replacement of personalized interaction with their customers, when in reality, it should enhance it. Customer interaction needs to function similarly across all verticals (even eCommerce), in that the first interaction should be treated with plenty of care through personalized yet strategic approaches. Building a positive image in the digital age isn’t just about making customers happy—it’s about making sure that those happy customers are vocal online. Squashing negative reviews only enhances the fact that there is a problem, but building an engaged and vocal audience of your happiest customers will gain you the trust and reputation you desire. I first realized this when working with a client for my digital marketing firm, GMR Web Team. This client was a local urgent care center with three locations, and they were on the verge of shutting down due to the extremely poor quality of their online reviews. Most people would assume these low review scores were due to the low quality of the business, right? In reality, this client provided excellent service to a group of very satisfied and loyal patients—but those patients were silent, while the unhappy ones could be heard by the entire world. That’s when I realized: It isn’t enough to provide excellent services if you aren’t reaching out to those happy customers afterwards. Unless those customers had an unforgettable and life-changing experience, then you can’t assume they will write a review online. Positive experiences are expected of you, so it’s likely they will be forgotten within a day or two. You must reach out to satisfied customers. Measuring customer satisfaction through internal outlets is crucial. Don’t rely on the internet to tell you how happy your customers are, but instead, capture the data necessary to make those distinctions. Capture all the information you can from a customer on that first visit. Use the information gathered to build that relationship and determine how their experience was with you. Once you open up a path of communication between you and your customers, then you will be able to precisely measure their satisfaction. Utilizing an automated process can simplify the results and lessen the workload from your end. What do you do with all of this data? It’s simple: Get your happy customers to write reviews and listen to your unhappy customers’ complaints. Allowing your unhappy customers to express concerns to you could rectify a bad situation or even simply prevent them from wanting to write a review online. Just keep your cool when interacting with them—there’s no need to make a situation worse. We’ve been discussing reputation in the digital age so far, so you may be asking yourself, “How has reputation management evolved from traditional marketing efforts?” The reality is that not much has really changed. Customers are still the voice of any business, and they are the only voice you should be listening to. Why? Because it’s often the only voice that your customers will listen to. The digital age has only enhanced that voice, so your company’s message is more likely to be lost in the fray. Don’t let your own voice drown in a sea of displeasure. Take control of your online reputation. Formerly a marketer for a few Fortune 10 companies, Ajay Prasad now owns GMR Web Team, a digital marketing agency dedicated to helping businesses maximize revenue from the internet and operates a seven-figure web based business, GMR Transcription, which he built from scratch and grew by using strategies that he now uses for his digital marketing clients. He continues to invest in web-based startups, including a patent-pending online reputation management tool known as RepuGen.